AirAsia India today announced the induction of an additional Airbus A320 aircraft in its fleet besides launching a new route, connecting Telangana capital Hyderabad with Bhubaneshwar from early 2018. The airline also said it will enhance connectivity to Jaipur and Bhubaneswar from its Bengaluru hub. AirAsia India will now have three direct flights between Bengaluru, Jaipur and Bhubaneshwar, the airline said in a statement. With the induction of one more aircraft, AirAsia India fleet size now stands at 14, it said. "We are happy to induct the 14th aircraft which was a target that we had set out to achieve this year. This is in line with our vision of providing regional connectivity and making air travel affordable for one and all," AirAsia India managing director and chief executive officer Amar Abrol was quoted as saying in the release. Air Asia India has added a pre-owned A320 to the fleet, as VT-IXR. AirAsia has resumed its service in the Chennai-Bengaluru sector more than two years after it suspended operations in this route. The Tata-AirAsia joint venture airline would fly five times a day in and out of Chennai to Bengaluru and Bhubaneswar. The first flight left for Bengaluru at 7.25 a.m today. AirAsia India, CEO and Managing Director, Amar Abrol announced the launch of five daily flights on Twitter. "We are back! Launching 5 daily flights connecting Chennai to Bangalore and Bhubaneswar #noweveryonecanfly #Chennai @AirAsia," he tweeted. The Bengaluru-headquartered air carrier also announced the induction of Airbus A320 into the fleet taking the total to 15. From today, the airline will operate three daily flights to Bengaluru and two to Bhubaneswar from Chennai making it as the 17th destination. "We are launching Chennai in the 17th destination in the network. Starting with four flights, three direct. Three from Bengaluru-Chennai-Bengaluru and one from Chennai-Bhubaneswar," he told . "The three Chennai-Bangalore will be morning, afternoon and evening. Chennai-Bhubaneswar starting a new route. It is daily", he said. To a query, he said, the airliner is "reintroducing the flights on the route" as the time was ripe. "Now we are at 15 aircraft. Today the new aircraft operations will begin. And that is going to these new routes," he said. AirAsia currently flies to 16 destinations from Bengaluru, New Delhi and Kolkata, covering Kochi, Goa, Jaipur, Chandigarh, Pune, Guwahati, Imphal, Vishakapatnam, Hyderabad, Srinagar, Bagdogra, Ranchi and Bhubaneswar. AirAsia India announced the induction of its 16th aircraft and addition of Nagpur and Indore to its list of destinations on Tuesday. "The brand has introduced new routes connecting Nagpur to Bengaluru and Kolkata and Indore to Bangalore and Goa," said a press release issued by AirAsia India. Indore, Nagpur, Kolkata and Bengaluru have a unique mix of consumers comprising of students, SMEs and traders and corporates, among others and AirAsia India takes pride in empowering them to travel faster at affordable costs. Speaking about the development, Amar Abrol, managing director and CEO, AirAsia India said: "2018 is already proving to be a great year for us as we have inducted our second aircraft in the very first quarter of the year. With the addition of Indore and Nagpur, we are connecting across the length and breadth of India. With 26% of our flyers being first-time flyers ever, providing regional connectivity is of utmost priority for us. Our ultimate vision is to focus on revolutionizing air travel in the markets that we operate in." AirAsia India has issued a Request For Proposals (RFP) for the lease of forty A320ceo Bloomberg news has reported citing sources close to developments. The aircraft will be delivered over the next 4-5 years and are presumably on dry-lease contracts. Last month, Chief Executive Officer (CEO) Amar Abrol told PNI that the AirAsia affiliate would use the added capacity to bolster its domestic operations while at the same time, venturing into the international market. Overseas flights are set to tentatively start early next year with flights to Southeast Asia initially followed by China. AirAsia India at in late-March and early-April 2018 introduces 2 new domestic routes, on board Airbus A320 aircraft. Planned new routes include the following. Air Asia India has added a pre-owned A320 to the fleet, as VT-JPR. AirAsia India today begins new domestic service, with the launch of Bangalore – Surat route. From 01JUN18, Airbus A320 aircraft will operate this route on daily basis, in the afternoon/evening hours. Air Asia CEO is facing corruption allegations to get into the India market. Never liked the way Air Asia India took advantage of the foreign ownership investment in the Indian airline market. The regulation calls for 51% Indian ownership or effective management control, but in this case Air Asia Malaysia is the largest share holder at 49% with defacto management control and the other Indian partners combined at 51%, but none of the Indian partners do not have effective management control. The original rule was intended for a single Indian entity with atleast 51% ownership, but due to confusion in the rule Air Asia India took advantage of this situation. They should force Air Asia India to rectify this situation to cede effective management control to an Indian entity or failing which, cancel the license of Air Asia India. This will reduce competition on an already hyper competitive domestic market and improve the bottom line for the existing players. The 51% on the Indian side of Air Asia's ownership is split between the Tatas and Laxmi Mittal's son-in-law (forget his name) . So the effective management control is still with Indian entities. Why don't these two get together and sort the issue? Maybe one can acquire the other's holding? In what way is Tony Fernandes or anyone else responsible if the government of India cannot state and formulate a regulation without causing confusion? And really, are they so stupid that they think no one will take advantage of their incompetence? It is about time that the government learned that as a regulatory body, it is their job to regulate properly without confusing all and sundry. It is also time that this government owns up and takes responsibility for its incompetence instead of just passing the blame. We have been an independent country since 1947. It is about time we got rid of this 'blame the foreigner, we Indians are perfect' mentality. It really gets on to one's nerves. 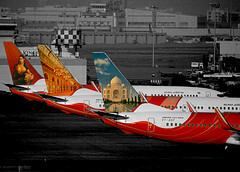 AirAsia India later this week is adding new domestic route, as the airline schedules Bangalore – Amritsar service. Operated by Airbus A320, this daily flight is scheduled to commence on 26JUL18. AirAsia India will commence two new routes from October 1. According to the airline, it will commence operations on the two new routes on its 19th aircraft which will be stationed in Kolkata. "With the 19th aircraft, AirAsia India is introducing two new routes connecting Hyderabad to Indore and Kolkata, increasing the frequency of flights between Hyderabad and Bengaluru," the airline said in a statement. "The airline is focused on expanding its presence in tier II and III cities, providing affordable airfares and improved services to flyers." AirAsia India has appointed former IndiGo executive Sanjay Kumar as its chief operating officer (COO) with effect from 3 December. Kumar, whose previous assignment was with IndiGo as chief commercial officer, has over 25 years of experience in the aviation industry. “We are thrilled to welcome Sanjay to the AirAsia India leadership team. He joins us at a time when the airline is in a growth momentum with an aim to venture forward in international operations,” AirAsia India chairman S Ramadorai said in a statement. AirAsia India Friday announced the induction of 20th aircraft in its fleet, making it eligible to fly on international routes. The Tata Sons-Air Asia invested joint venture airline also said it will add Mumbai in its network from early next year with the launch of daily flight services to the country’s financial hub from Bengaluru, starting January 15. This will be Malaysian airline group’s third entry into the Mumbai market after discontinuing the services to the city first by AirAsia Berhad in 2012 and then by its subsidiary Indonesian AirAsia X in April this year. “We are pleased to make the much-awaited announcement of adding Mumbai to our network. We’re also happy to welcome our 20th Airbus A320 aircraft to our fleet,” Sunil Bhaskaran, chief executive officer, AirAsia India, said in a release. The daily services on the Bengaluru-Mumbai route will commence from January 15, the airline said. AirAsia India last week added new domestic route from Chennai, which saw the launch of Chennai – Hyderabad service. Airbus A320 aircraft operates this route once a day, since 21DEC18. AirAsia India in January 2019 is adjusting service at Bangalore, where the airline plans to introduce Bangalore – Mumbai route, starting 15JAN19. Airbus A320 aircraft operates this route on daily basis. Air Asia India on Thursday announced it would operate services on the New Delhi-Hyderabad sector from February 1 as part of its expansion plans. The New Delhi-Hyderabad flight would start from the national capital at 6.05 am and 5.50 pm. In the return direction, the flight would start from Hyderabad at 8.45 am and 8.25 pm, the airline said in a release. Air Asia also announced the addition of flights connecting New Delhi with Srinagar and Pune. This would be the second connection between the national capital and Srinagar and Pune, the release said. The two flights from Delhi to Srinagar and Delhi to Pune will start at 12.15 pm and 10.55 pm respectively. The return flights from Srinagar and Pune will be at 2 pm and 1.30 am. AirAsia India had launched the Chennai-Hyderabad flight towards the end of December 2018. Sunil Bhaskaran, Managing Director and Chief Executive Officer, AirAsia India, said "These new connections are a testimony to our commitment 'Now Everyone Can Fly'. We recently announced the much awaited connection between Bengaluru and Mumbai and hope to open out Mumbai to several other cities on our network, offering affordable fares to our guests." Bookings for the new sectors will start from January 10, 2019, but will be effective from February 1 2019. AirAsia India has applied to the aviation ministry for permission to start overseas flights following four-and-a-half years of operations in the domestic sector. “We received an application from AirAsia India last week and the airline primarily wants to fly to south-east Asian nations, to start with,” said an aviation ministry official who did not want to be identified. AirAsia India did not reply to a query sent to them. A senior executive of the airline said the company would not comment. AirAsia India in late-March 2019 is expanding service from Delhi, where the airline introduces new Delhi – Indore nonstop flight. Service commences on 25MAR19, with A320 operating once a day. Separately, the airline will introduce 3rd daily flight on following routes, also from 25MAR19: Delhi – Bangalore, Delhi – Pune and Delhi – Srinagar. AirAsia India this week is expanding service from Mumbai, where the airline introduces 5 new routes, with a total of 42 weekly flights. Planned new routes include the following.